A Fry’s Five Boys chocolate wrapper. The bars were marked off into five segments, each with one of the faces stamped into the chocolate. The bars originally cost 1d when launched in 1902, that’s just under half of 1p in today’s money. 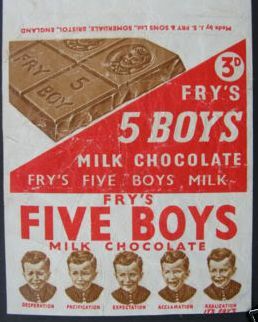 Fry’s Five Boys was a solid milk chocolate bar that was once the most recognised chocolate bar in the world. It was still being sold until its withdrawal in 1976. But who remembers it now? The five pictures were photographs taken in 1885 and were used by J S Fry & Sons in its advertising; appearing on enamelled metal signs displayed outside confectioners, on posters and in newspapers. The boy was Lindsay Poulton, aged five, and his father and grandfather took the photographs for which Fry’s paid £200, a very large sum at the time, to have exclusive use of them. Lindsay Poulton was still around in 1960s when he was tracked down by the Bristol Evening Post to Rhode Island in the USA. Mr Poulton remembered the photographic session well, particularly the Desperation shot, when his grandfather induced the necessary look, and the tears, by placing a cloth soaked in photographer’s ammonia around his grandson’s neck! 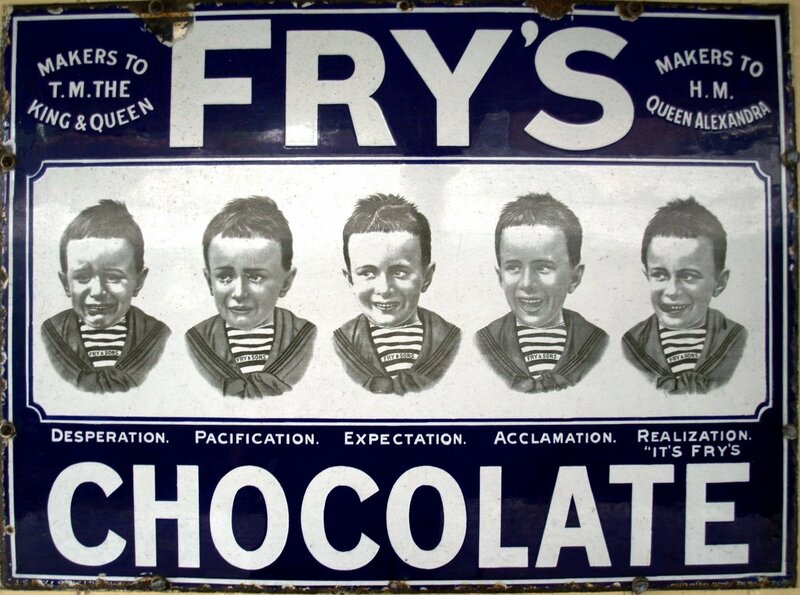 The five faces of Fry’s Five Boys chocolate on an enamelled metal sign. Desperation – no chocolate, Pacification – the promise of chocolate, Expectation – the prospect of chocolate, Acclamation – happiness at receiving chocolate, and Realization – eating the chocolate, and discovering that it is a Fry’s milk chocolate bar! So when the chocolate bar was introduced in 1902 with its distinctive wrapper, the Five Boys image became irretrievably connected with it. There was also a bar called Fry’s Five Centres produced from 1934 to 1992 but this shouldn’t be confused with the Five Boys bar. Five Centres was like today’s Fry’s Chocolate Cream, a fondant centre enclosed in dark chocolate, but with different flavoured centres. Strawberry, orange, raspberry, lemon and pineapple at first, then later on, coffee, lime, and blackcurrant replaced strawberry, lemon and pineapple. I can remember Five Boys from the 1950s and 1960s. I thought the pictures of the boy were a bit weird, even scary. Incidentally J S Fry & Sons started with Joseph Fry, a Quaker apothecary, making chocolate in Bristol around 1759. The Quakers were formed as a protest against the established Church and its members were debarred from many public and civic offices, and professions such as medicine or the law were not open to them. This is why so many Quakers gravitated towards business and commerce. As Quakers were concerned about levels of alcohol misuse in the population at large, the move into chocolate that began with cocoa drinks was therefore a reaction against the perceived misery and deprivation caused by alcohol.